Tulip trees (Liridendron sp. 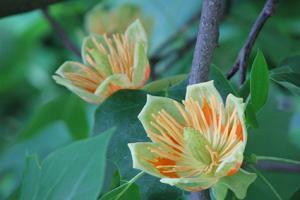 ), also called tulip poplar, are an enormous hardwood species native to the eastern United States. They grow to a greater height and girth than any other species in the East and have a spectacular show of flowers that have made them popular as a landscape specimen. Tulip trees are so named because of the tulip-like appearance of their flowers. Emerging in mid-spring, the three-inch blossoms are yellow with orange streaks radiating on the inside of the petals and often tinged with green or pink tones on the outside. The foliage resembles that of poplars with four pointed lobes and turns golden yellow and then brown in fall. They are considered a choice ornamental specimen as they have a very symmetrical branching structure and typically develop a pleasing form without help from an arborist. Tulip trees are hardy in USDA zones 5 through 9, which means they will grow anywhere in the continental U.S. other than the coldest, most northerly or high elevation places, like North Dakota or around the Rockies, and subtropical places like Miami or Los Angeles. They are water lovers, and while they are not as commonly grown in the West, they do just fine if they have ample irrigation. However, it's generally not recommended to plant them in desert regions. 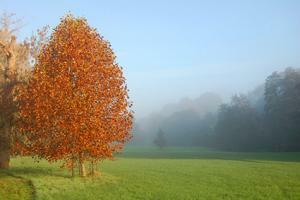 Plant tulip trees in spring or fall to allow them to weather the shock of transplanting while temperatures are cool. They are known to reach 150 feet or more in the wild, though 80 to 100 feet is more common in cultivated landscapes. Plant them at least 20 feet from any foundation or paved surface as the powerful root systems are known for causing damage. Tulip trees like rich moist soil and should be watered and mulched religiously for several years after planting. They make a great backyard shade tree and are best on larger properties where they are not out of proportion to the size of the landscape. Aphids are highly attracted to tulip trees. They are not life-threatening to the tree, but they secrete a sticky substance that then becomes colonized by a sooty black mold and drips onto everything that is under the tree. For this reason, it is recommended to plant them where their branches will not grow to hang over parking areas and paved surfaces. 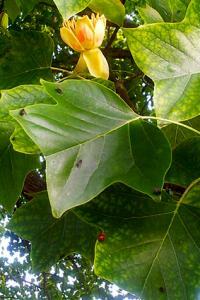 Tulip trees are also very sensitive to drought. During hot, dry periods the leaves may turn yellow and fall off prematurely; if this occurs repeatedly it will slowly weaken the tree, shortening its lifespan. A deep monthly soaking in dry years is necessary to keep tulip trees healthy. The basic native species is most commonly planted, but a few cultivars have been developed. 'Aureo-marginatum' has yellow margins on the leaves. 'Fastigiatum' has a narrow columnar form. 'Pyramidale' has a narrow pyramidal growth habit. Tulip poplars are definitely not a tree for every property, but they are one of the most refined shade trees available for gardeners with the space to grow them. 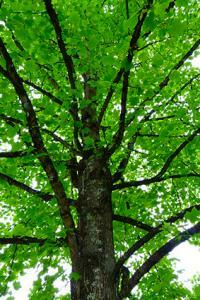 A mature tulip tree is like a forest unto itself and makes an inviting backyard destination for picnics and play.